A delicious way to get your veggies and protein all in to one delightful dish! Make the dressing: Cook the bacon over medium heat until crispy. Place the cooked bacon on paper toweling to drain and reserve ½ tablespoon of the fat. Add the mustards, bacon fat, and lemon juice to a large bowl. Whisk until smooth. Slowly drizzle in olive oil while whisking to make an emulsion. Season to taste with salt and pepper. Set aside. Compose the salad: Chop the bacon into bite sized pieces. Add spinach, Brussels sprouts, shallot rings, bacon pieces, and croutons to the bowl with the dressing. Toss lightly to completely coat ingredients. Plate the salads. 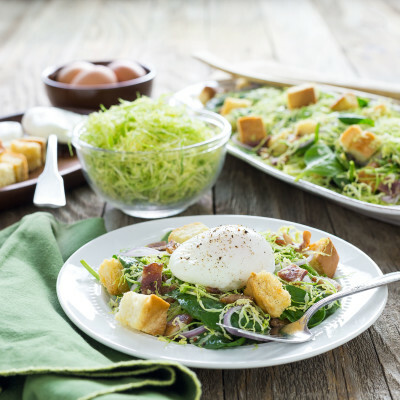 Add a poached egg to the top of each salad. Top with freshly cracked pepper and serve.